You wouldn’t forget to include your rent or car payment in your budget, but chances are you are forgetting one of these items. These irregular payments can often be overlooked. While it may not be a big issue to work it into a budget for some, it could be a major inconvenience for others. Be sure to include these items in your next budget planning session. From oil changes and new tires, to car tags and property taxes; these fees add up. Be sure to include these in your budget. Let’s face it, cars need repaired. While it may be easy to budget in some slightly regular payments (oil changes and tire rotations) car repairs could be a little trickier. You could designate a certain amount of your savings toward these repairs, or just start a category fund for them. Either way, be sure to include these. A lot of budgets include monthly pet care costs with the household supplies budget. This isn’t a bad idea as long as you are factoring in all of the possible costs associated with pet care. If possible, create a separate category in your budget for your pets. Include pet food, toys, flea and tick treatment, heart worm prevention, and vet bills. Mortgages and rent are some of the top items included in a budget. Smaller housing necessities can easily be overlooked. Toilets get clogged. Windows Break. Accidents happen. Plan for them by including them along with landscaping, pest control, and other repairs in your budget. Have you ever checked your bank balance to see a smaller number than expected? Maybe it’s the magazine subscription, or club dues that you forgot were due. Wouldn’t it be nice to not have to worry about these annoying surprises? When your next magazine comes in the mail, see if it’s included in your budget. If not, add it along with any other annual fees and subscriptions you may have. Your boss is in the hospital and your co-workers are collecting money to send flowers. You didn’t budget for this. Now what? Don’t want until the event happens to begin saving for it. Add a “Gifts & Special Occasions” category into your budget. People get married and have children, birthdays happen, and you should be prepared. Hair cuts, salon visits, cosmetic purchases, and clothes for the kids all chip away at an already dwindling budget. Don’t forget to include these items in your budget. If you have ever been the victim of an unexpected computer crash then you know the feeling of “What next?” Help prepare for these annoying events by working them into your budget. Don’t forget to include things like software upgrades, new power cords, and items like SD cards. Over the counter medication, daily vitamins and supplements, medical devices, and other medical supplies can easily be forgotten. While it’s perfectly okay to include these in your general household supply expenses, I recommend making a new category for them. You may even begin to notice a trend in your health by tracking these expenses separately. If you have kids, like to read, or attend educational workshops, add these into your budget: school supplies, workshops, seminars, conferences. Even if you don’t have kids, don’t like to read, and don’t attend workshops, add a category for Career Development. Something is bound to pop up. Investing in your future by investing in your education experiences is a smart choice. Alright, time to fess up. Did you forget to include one or more of these items in your budget? Let us know in the comments which one slipped your mind. 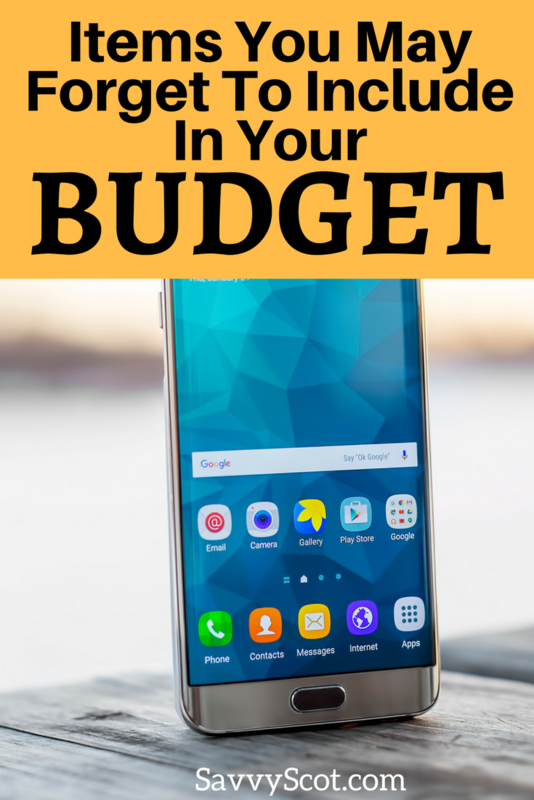 If you don’t have a budget yet, what are you waiting for? Find out how you can get the mindset you need in order to start budgeting. Gifts are where I really struggle. Admittedly, I forget about birthdays, and scramble to find a gift that usually arrives to them late. I have recently started using tax return money to buy everyone gifts for the whole year all at once. That way, I don’t need to budget separately for birthdays or the holidays.